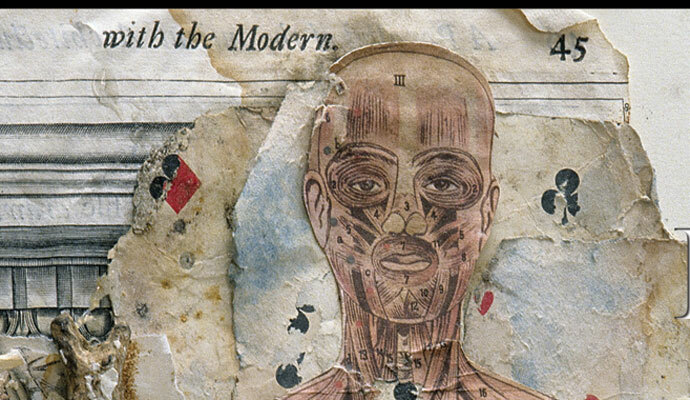 Skin Job, the new poetry chapbook by Evan J. Peterson (Minor Arcana Press, 2012), is a composite creature: part cinema, part collage, part body parts in formaldehyde. The title is from Blade Runner: “‘Skin jobs’. That’s what Bryant called Replicants. In history books he’s the kind of cop who used to call black men ‘niggers’.” The images are lightly flayed, reminding one of Halloween and the various haunted houses that one visits during this time of year, being sniffed by carnies in horrorshow getup, and the one with the iron mandible who offered to take one apart on his operating table, but it wasn’t really scary and one has a cackle at their expense, poor dears are probably paid less than minimum wage, to boot. The more elegant interpretation is of Peterson’s work in line with his cinematic obsessions (“interests” would be coy in usage, after the allusions of the preceding paragraph, obviously)––The Rocky Horror Picture Show, Mommy Dearest, Flesh for Frankenstein––as a work of the avant-garde cinema (indeed, the book has a trailer). With a tongue-in-cheekiness that rubs up against his darker inventions: “The Froo-Froo Mutant,” for example. A darker side evocative of Dennis Cooper (does this go without saying? perhaps), the atrocities of A.S. Byatt’s fictional novel Babeltower (from within Babel Tower) by fictional writer Jude and perpetrated by his fictional character Culvert at fictional locale La Tour Bruyarde, and even his Monsieur Monster is reminiscent of Amy Gerstler’s Mrs. Monster. Would they have hit it off? One couldn’t say for sure. Peterson is playing poetry in the Cinema of Cruelty, every orifice is an antechamber to the operating theater. Pop culture remnants splatter the walls, and layers of meat meaning are unpacked (and then probably hung on meathooks) around the nightmare images of monster, movie, and man. Which role is a performance, really? Peterson’s answer is in his dissection and reanimation of familiar tropes, a mixture of the hideous and the fabulous in an attempt to give birth to new forms. A raven is a writing desk and a poem is a blockbuster movie. Everyone’s stitches are showing. And if you were only one thing and not two or more things dismembered and remembered differently, a patchwork of identities, then it’s a sad story but hybid vigor ultimately wins out. Skin Job is available from Minor Arcana Press.